NAHBS Roadbikereview Videos and Photos and Awards. Every year, there is a pilgrimage of some of the country’s best bike builders to a city selected by NAHBS to showcase the best hand made bikes. This year, the city was Sacramento and it attracted a ton of builders from around the country and around the world. The halls were jam-packed each day with cycling enthusiasts eager to see the what the best builders had to offer. 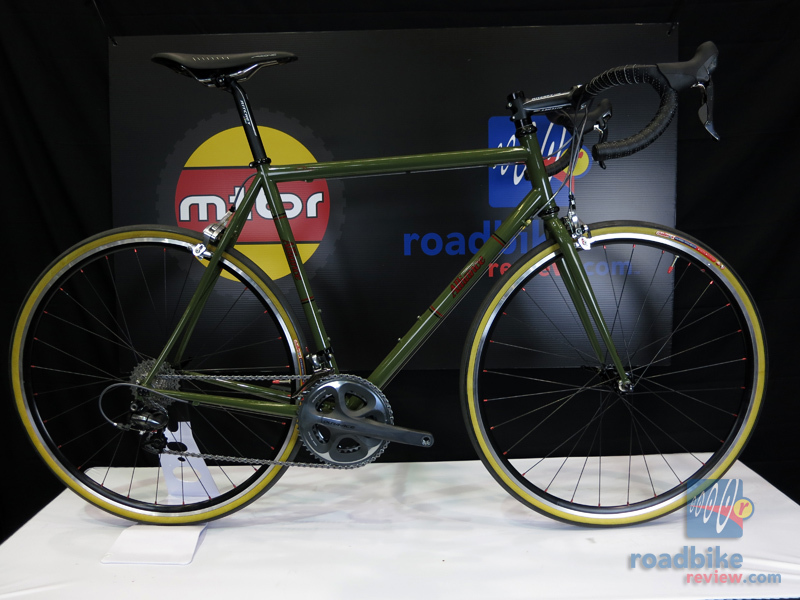 The interesting thing about the Handmade bike show is it not only showcases traditional design and craftsmanship but it also exhibits some leading edge design. Builders are always looking for the best solutions to many of cycling’s needs and this show not only shows where cycling came from but also where it is headed. Check the links below to view our coverage of some of the best builders at the show. And see our impressions below of what the biggest trends are in this year’s show. 1) Big Tire Road Bikes – Many manufacturers brought their best bike to our booth and at least six of them brought road bikes with big tires. Some called it an Adventure Road Bike or Dirt Road Bike but the concept was a road bike that can go on trails or broken pavement. It is similar to a cyclocross bike but a cross bike typically has knobby tires, high bottom bracket, steep head angle and bad brakes. These Fat Tired Road Bikes use long reach caliper brakes to make room for tires up to 34c or beyond. Some of them use disc brakes as well. The geometry is similar to a road bike so it can handle and descend like a the best road bikes. They key difference really is the big tires allow the rider to explore and keep going as the good pavement ends. The rider can punch through trails and parks and keep going on long day rides or multi-day excursions. Technologies that have made this possible are: disc brakes or long reach caliper brakes and high quality big road tires. 2) Fat Bikes – Fat bikes are mountain bikes with tires almost as big as a motorcycle’s. These bikes float on these big tires usually at 10-12 psi and they allow the rider to handle almost any terrain. Initially popular for the snow and beach areas, the range of fat bikes as increased to any terrain available. When a normal mountain bike tire is stopped by terrain that is soft and ungroomed, a fat bike is able to float through and roll over with ease. And despite looking slow and difficult to maneuver, fat bikes are usually able to keep up with normal mountain bikes in cross-country terrain. Even without any suspension, fat offer a comfortable ride in rough terrain because of the huge tires with low pressure. Most fat bikes right now are hardtails but NAHBS showed us front suspension bikes and rear suspension bikes as well. 3) Bamboo and Stainless Steel Bikes – These new materials were very common at the show. Bamboo is used because it is sustainable, attractive and it delivers a supple ride quality. Bamboo wood absorbs a lot of the shock and vibration from the road or the trail so the rider benefits from a smoother ride. With advanced wood selection and manufacturing, builders are able to keep the weight down and build high performance in these frames. Stainless steel was common too as builders dubbed it the ‘cheaper titanium’. It is durable, rust proof, light like titanium but it is about $500 less for a comparable frame. It has an attractive finish too that can be maintained easily to look like new even after several years of riding. 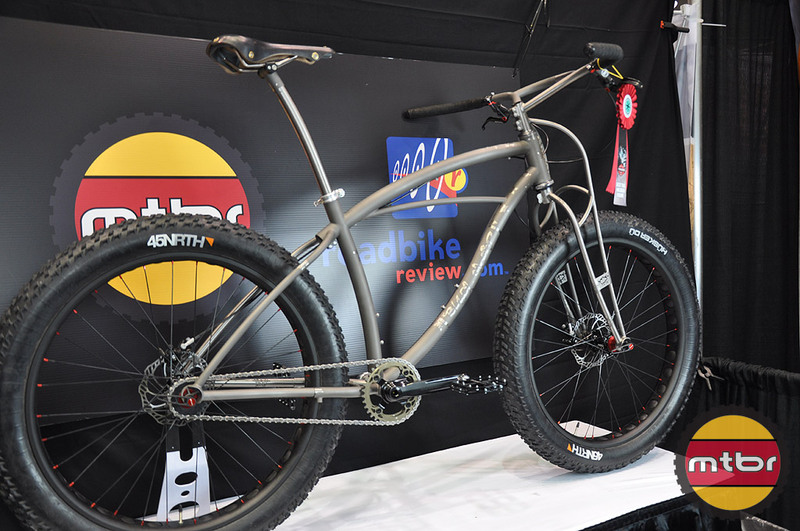 Every year, NAHBS gives out awards to the best bikes of the show. 2012 showcased an selection of winners. BEST CYCLOCROSS BIKE 611 Bicycle Co.
BEST EXPERIMENTAL BIKE Black Sheep Fab. BEST STEEL FRAME Ellis Cycles Inc.
BEST TIG CONSTRUCTION Black Sheep Fab.